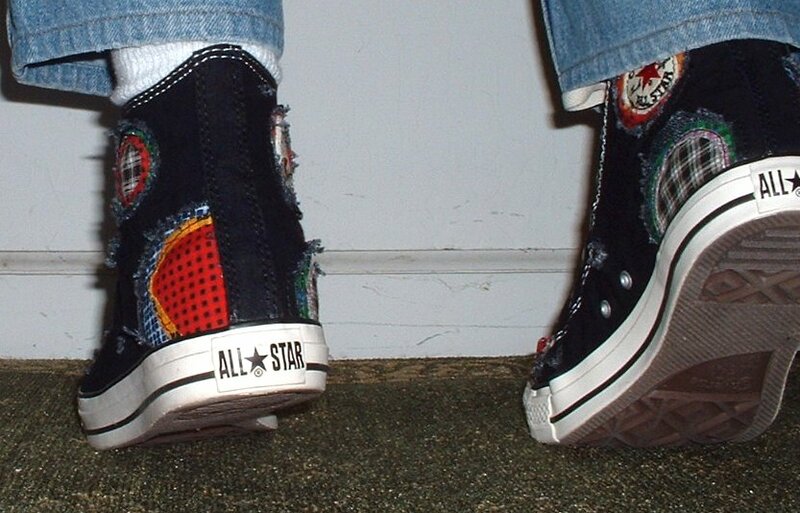 Photo gallery of chucks with patchwork uppers. 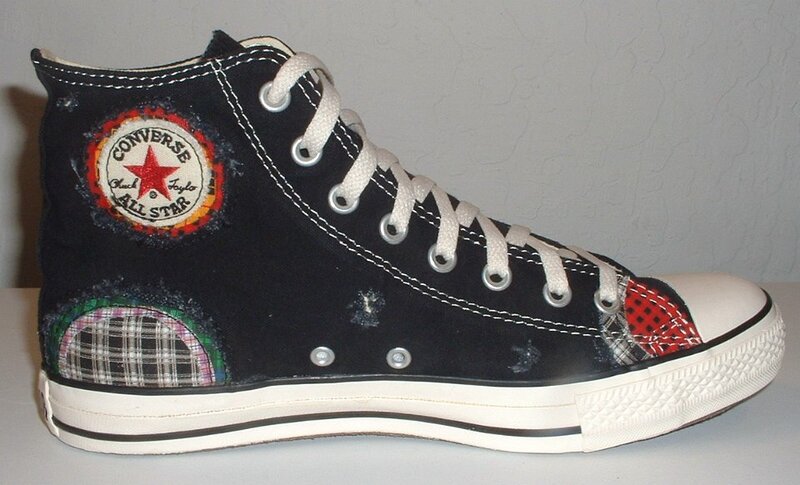 1 Patchwork High Top and Low Cut Chucks Inside patch view of a right black high top. 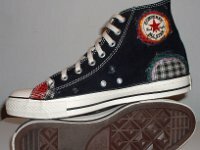 2 Patchwork High Top and Low Cut Chucks Outside view of a right black high top. 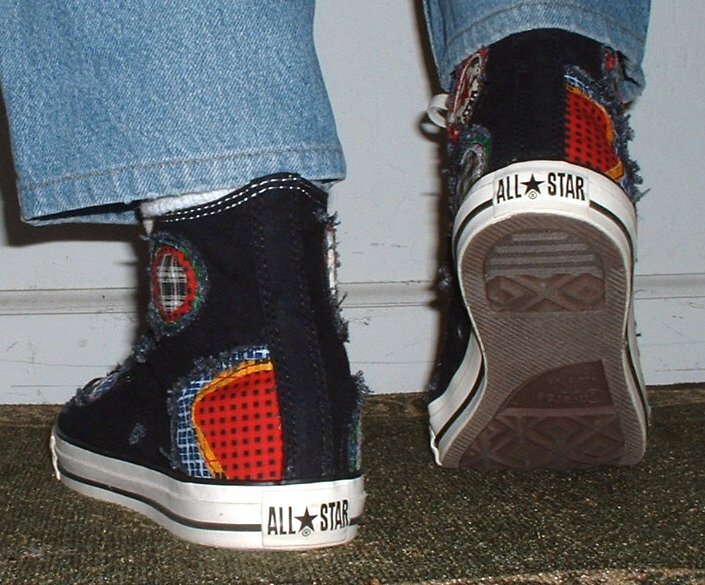 3 Patchwork High Top and Low Cut Chucks Inside patch view of a left black high top. 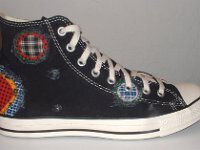 4 Patchwork High Top and Low Cut Chucks Outside view of a left black high top. 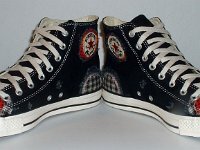 5 Patchwork High Top and Low Cut Chucks Front view of a pair of black high tops. 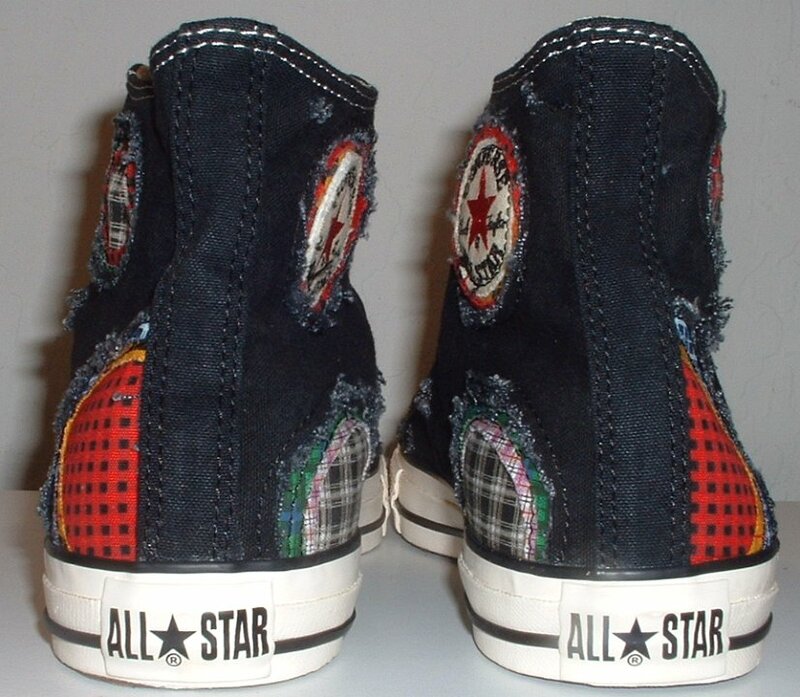 6 Patchwork High Top and Low Cut Chucks Rear view of a pair of black high tops. 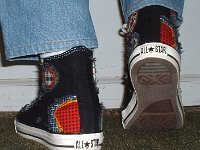 7 Patchwork High Top and Low Cut Chucks Top view of a pair of black high tops. 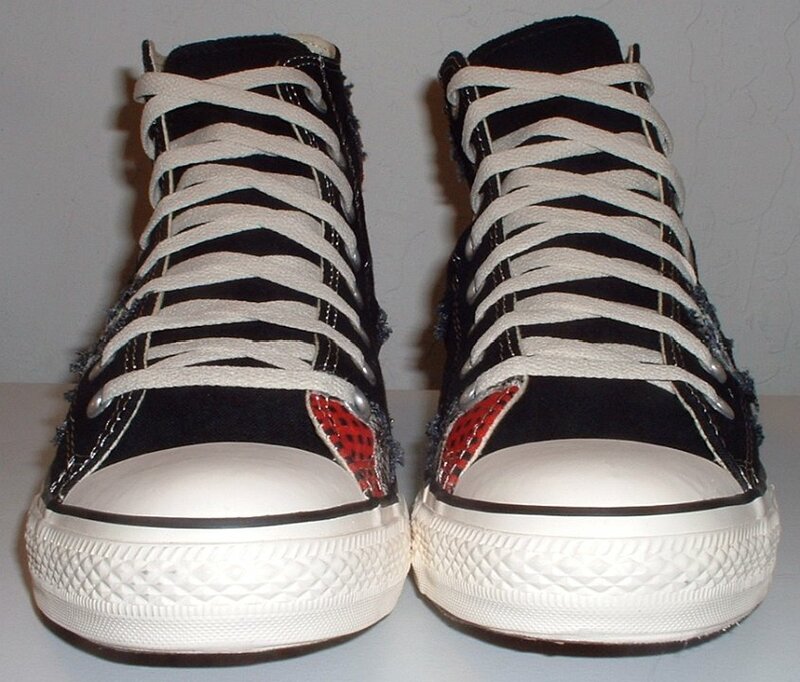 8 Patchwork High Top and Low Cut Chucks Angled side view of a pair of black high tops. 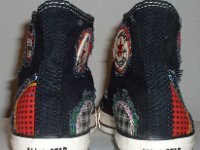 9 Patchwork High Top and Low Cut Chucks Angled front view of a pair of black high tops. 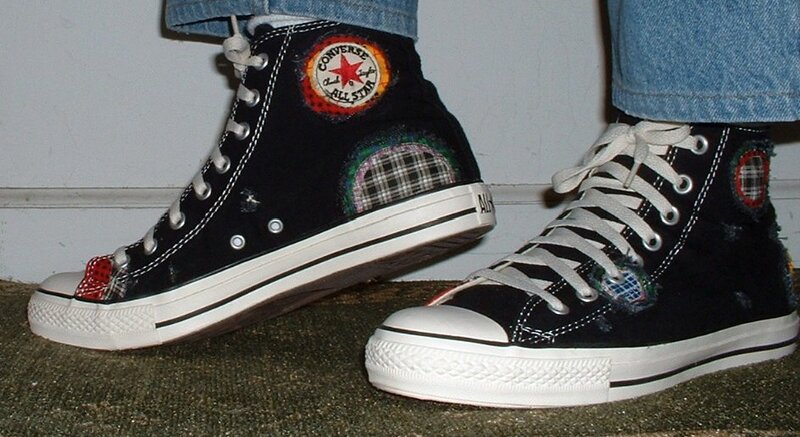 10 Patchwork High Top and Low Cut Chucks Inside patch views of a pair of black high tops. 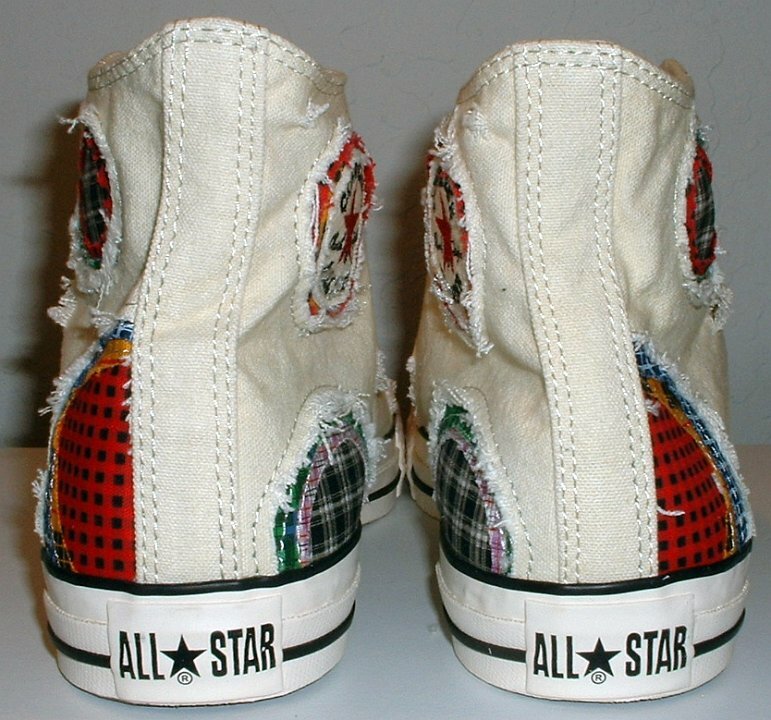 11 Patchwork High Top and Low Cut Chucks Inside patch and sole views of a pair of black high tops. 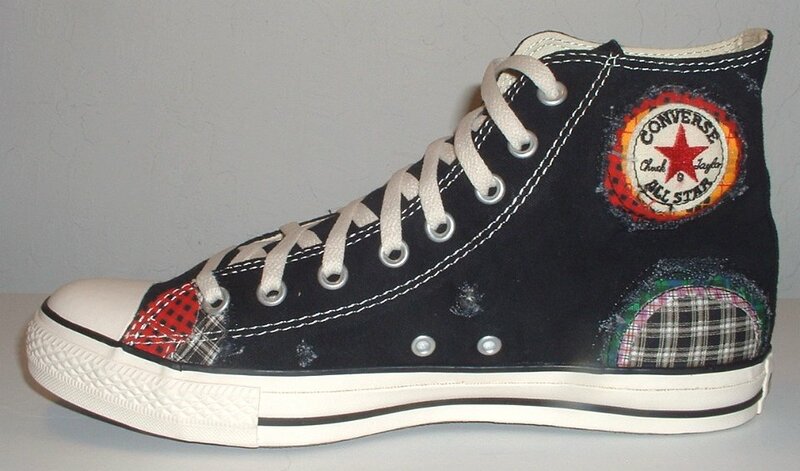 12 Patchwork High Top and Low Cut Chucks Angled side views of a pair of black high tops. 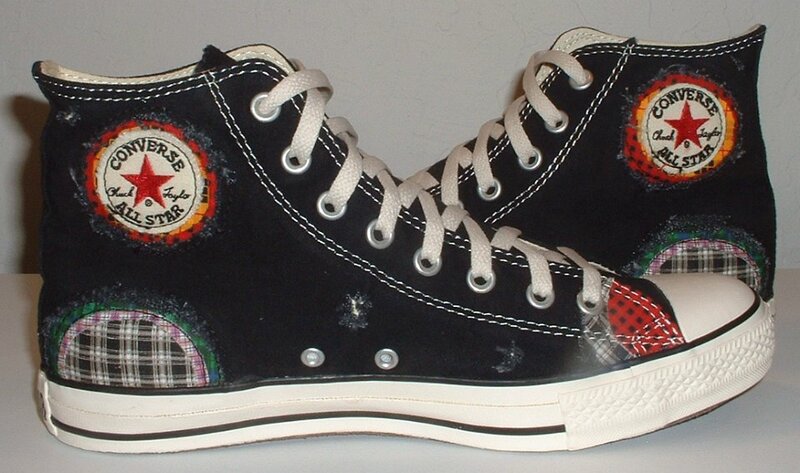 13 Patchwork High Top and Low Cut Chucks Wearing black patches high tops, side and sole view. 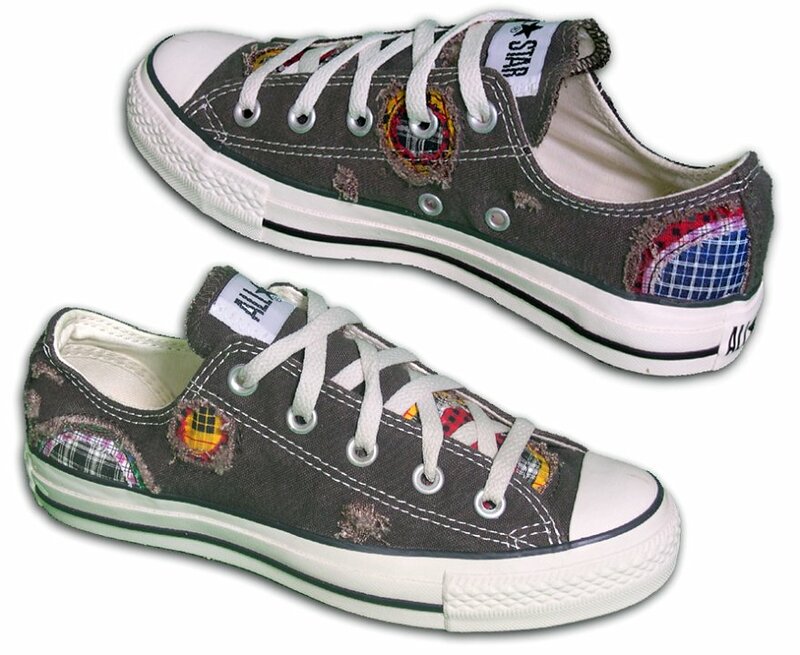 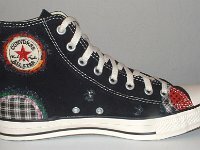 14 Patchwork High Top and Low Cut Chucks Wearing black patches high tops, side and sole views. 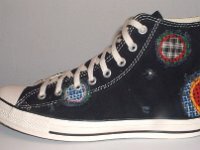 15 Patchwork High Top and Low Cut Chucks Wearing black patches high tops, front view. 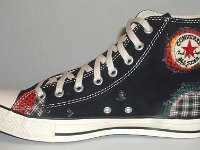 16 Patchwork High Top and Low Cut Chucks Stepping out in black ptaches high tops, front view. 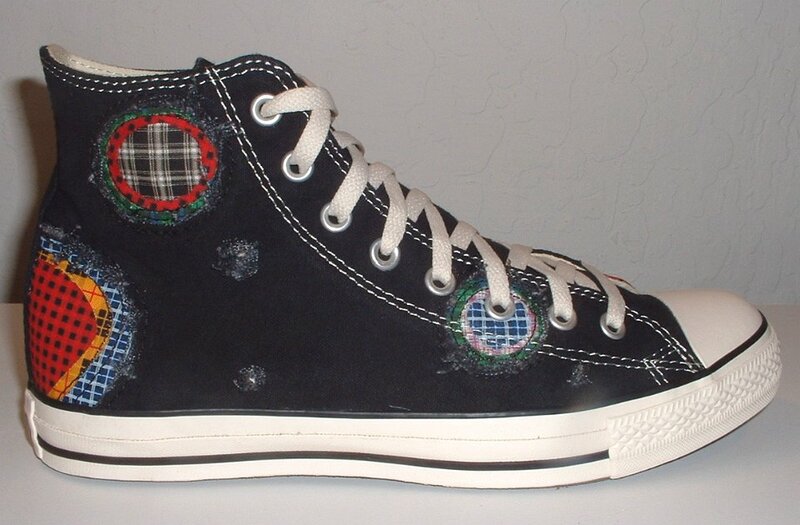 17 Patchwork High Top and Low Cut Chucks Wearing black patches high tops, side and angled front views. 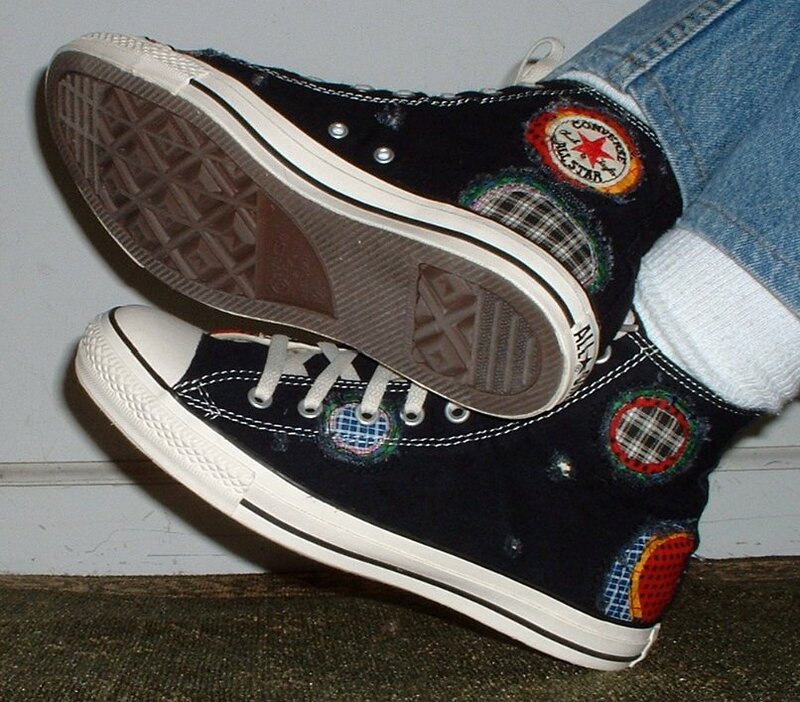 18 Patchwork High Top and Low Cut Chucks Stepping up in black patches high tops, rear view. 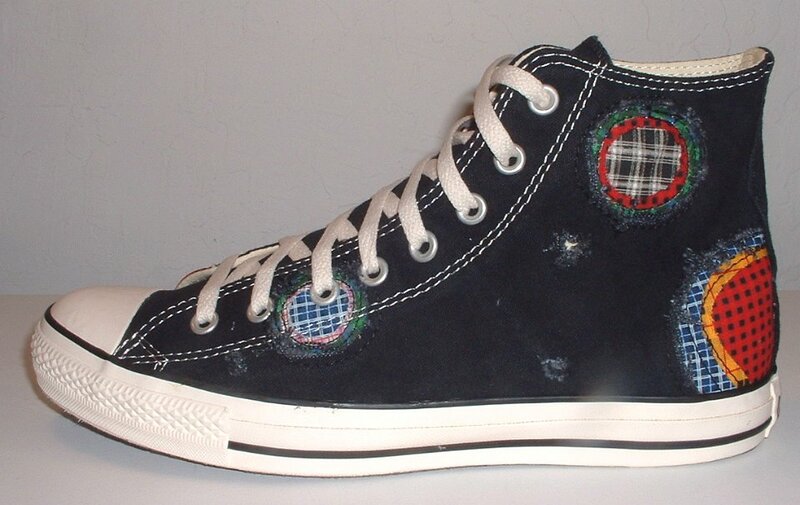 19 Patchwork High Top and Low Cut Chucks Wearing black patches high tops, side view. 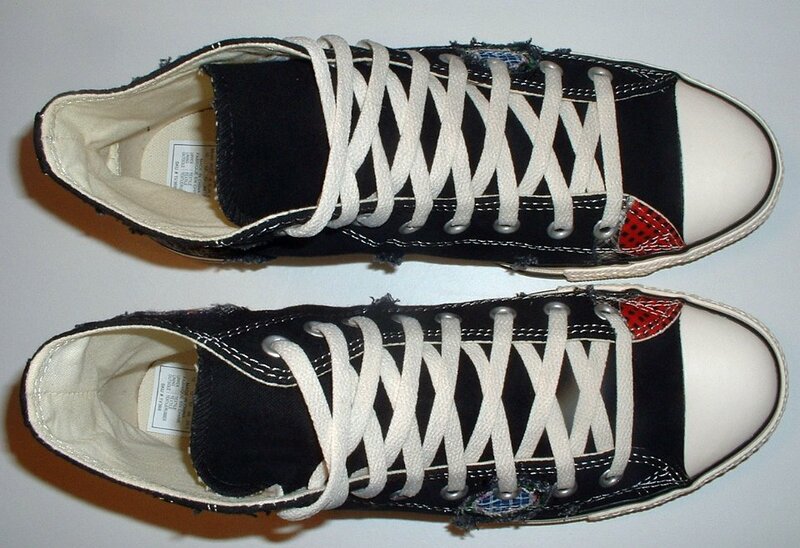 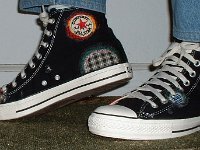 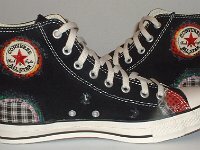 20 Patchwork High Top and Low Cut Chucks Wearing black patches high tops, rear view. 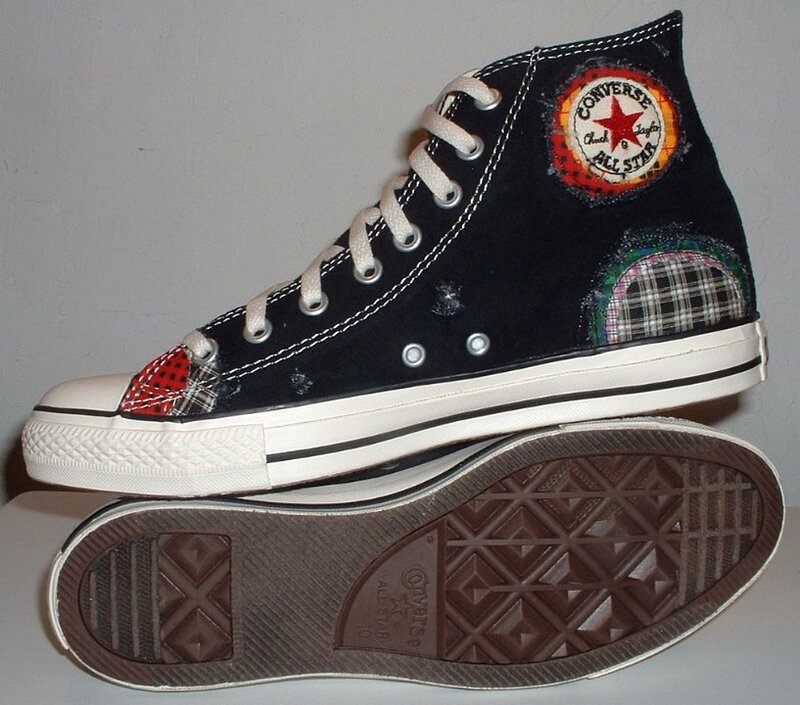 21 Patchwork High Top and Low Cut Chucks Angled side views of a pair of chocolate brown low cuts. 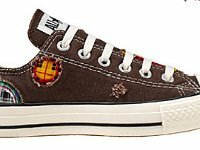 22 Patchwork High Top and Low Cut Chucks Side view of a chocolate brown low cut. 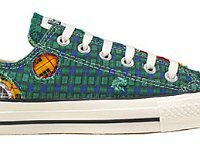 23 Patchwork High Top and Low Cut Chucks Side view of a right green plaid low cut. 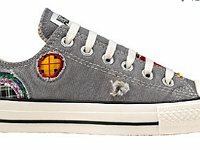 24 Patchwork High Top and Low Cut Chucks Side view of a right grey low cut. 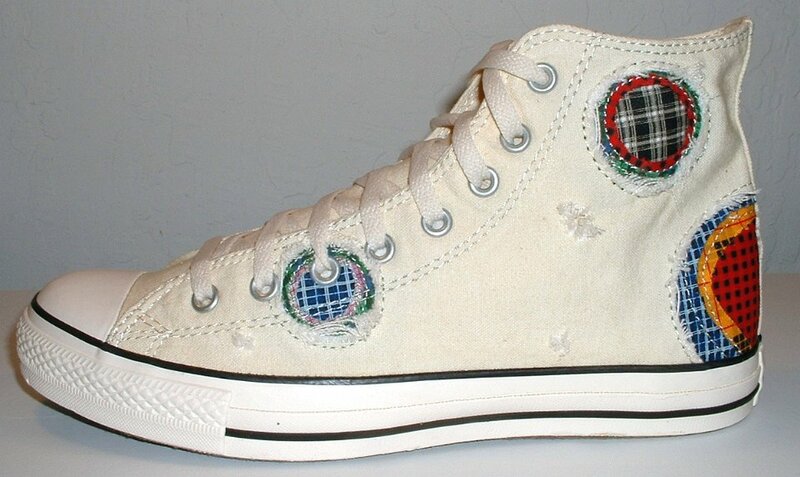 25 Patchwork High Top and Low Cut Chucks Inside patch view of a right natural white high top. 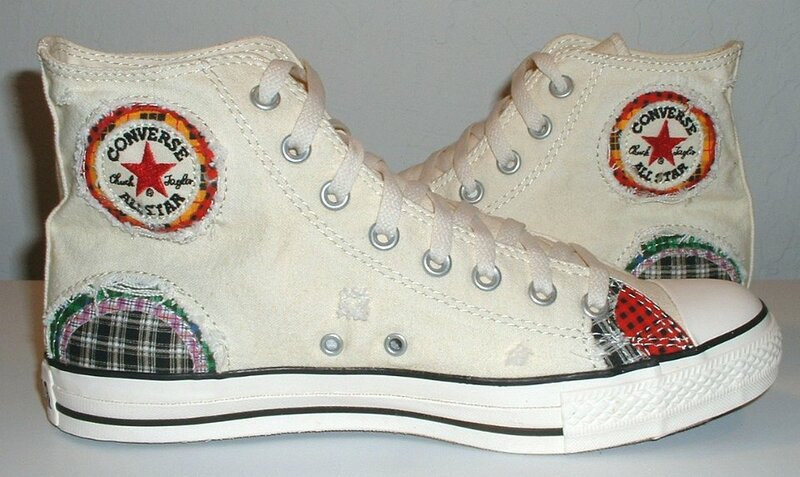 26 Patchwork High Top and Low Cut Chucks Outside view of a right natural white high top. 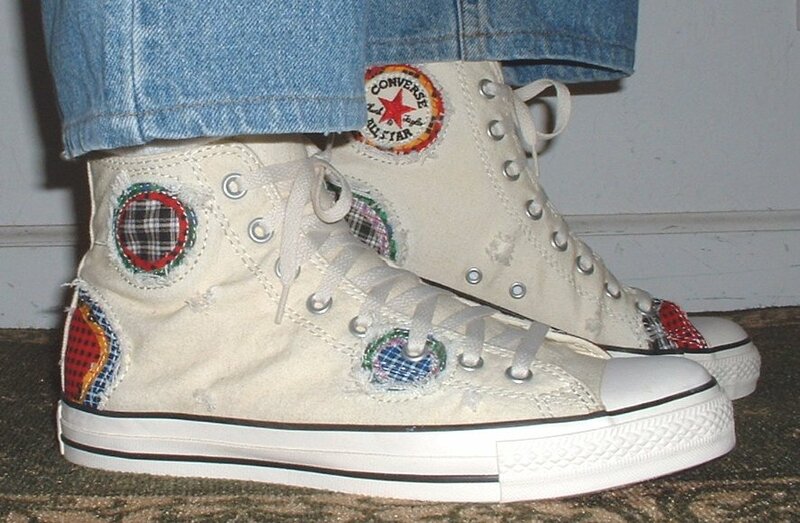 27 Patchwork High Top and Low Cut Chucks Inside patch view of a left natural white high top. 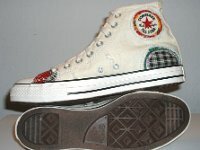 28 Patchwork High Top and Low Cut Chucks Outside view of a left natural white high top. 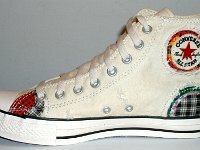 29 Patchwork High Top and Low Cut Chucks Front view of a pair of natural white high tops. 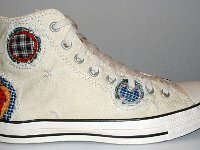 30 Patchwork High Top and Low Cut Chucks Angled front view of a pair of natural white high tops. 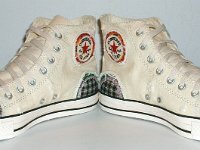 31 Patchwork High Top and Low Cut Chucks Rear view of a pair of natural white high tops. 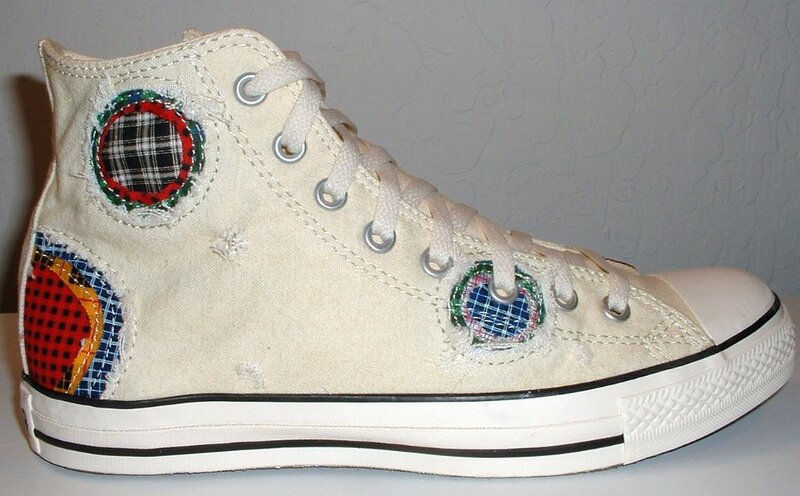 32 Patchwork High Top and Low Cut Chucks Angled side view of a pair of natural white high tops. 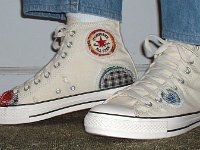 33 Patchwork High Top and Low Cut Chucks Inside patch views of a pair of natural white high tops. 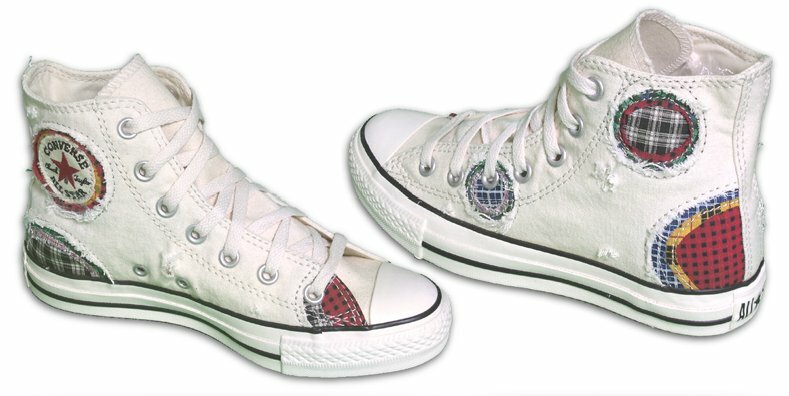 34 Patchwork High Top and Low Cut Chucks Top view of a pair of natural white high tops. 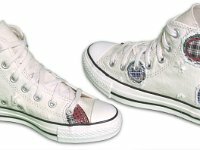 35 Patchwork High Top and Low Cut Chucks Angled side views of a pair of natural white high tops. 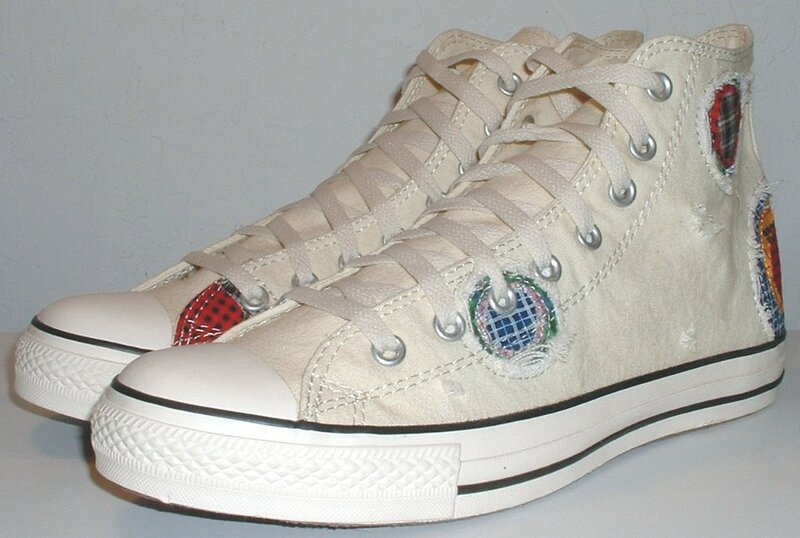 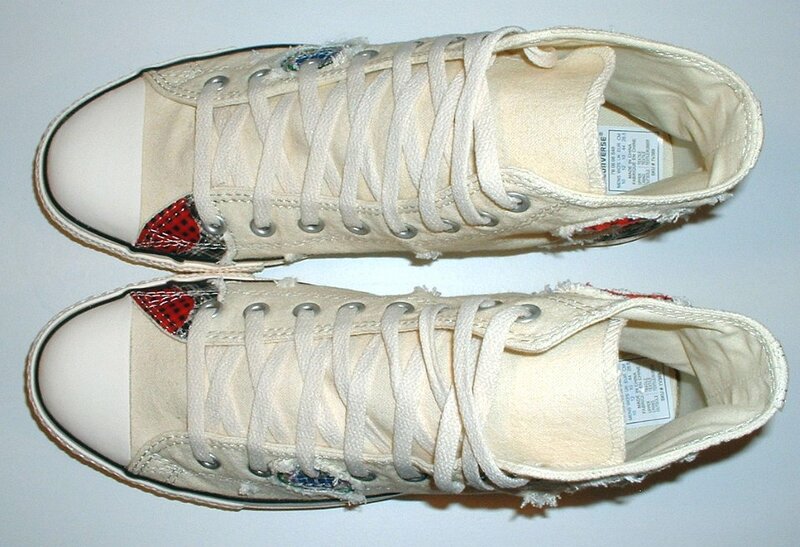 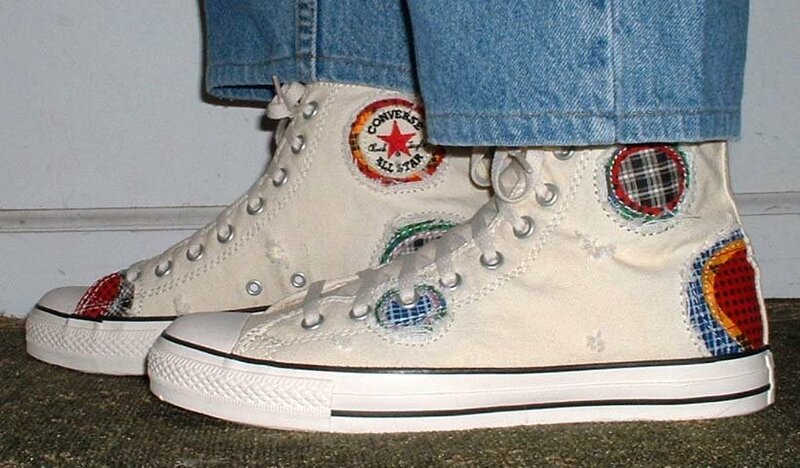 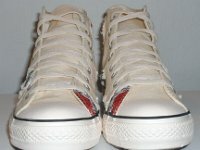 36 Patchwork High Top and Low Cut Chucks Inside patch and sole views of a pair of natural white high tops. 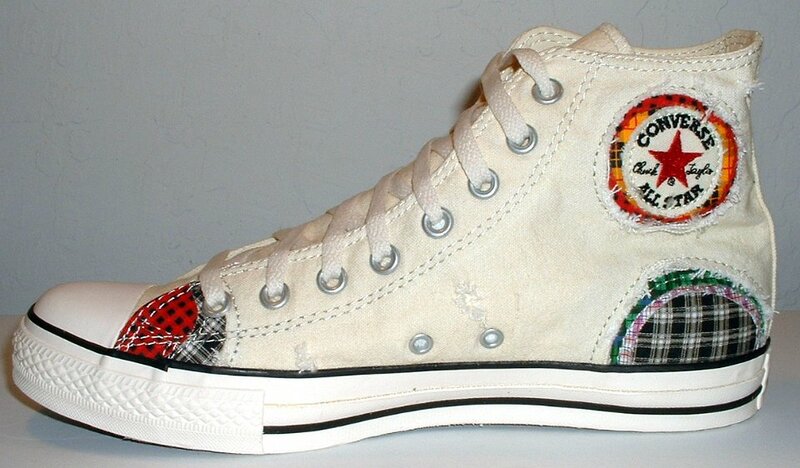 37 Patchwork High Top and Low Cut Chucks Wearing white patches high tops, side and sole views. 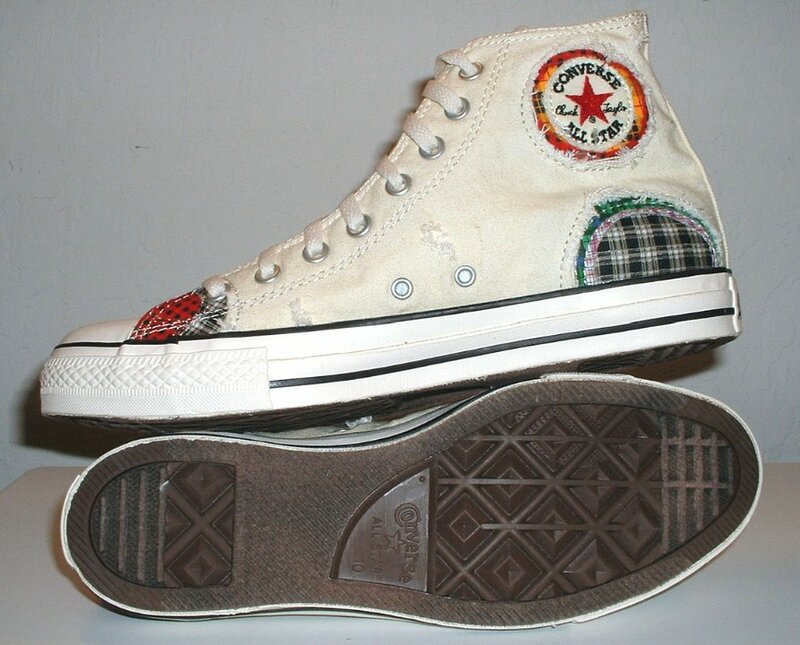 38 Patchwork High Top and Low Cut Chucks Wearing white patches high tops, sole and side views. 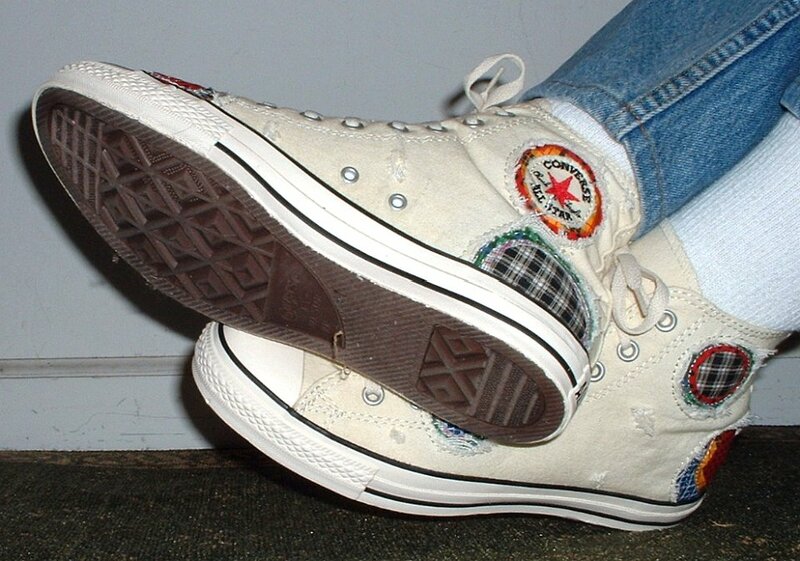 39 Patchwork High Top and Low Cut Chucks Wearing white patches high tops, angled side and top views. 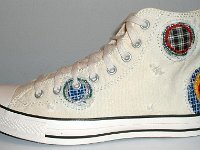 40 Patchwork High Top and Low Cut Chucks Stepping out in white patches high tops, front view. 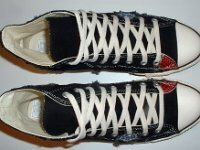 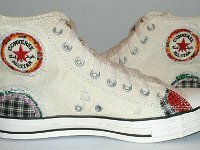 41 Patchwork High Top and Low Cut Chucks Wearing white patches high tops, front view. 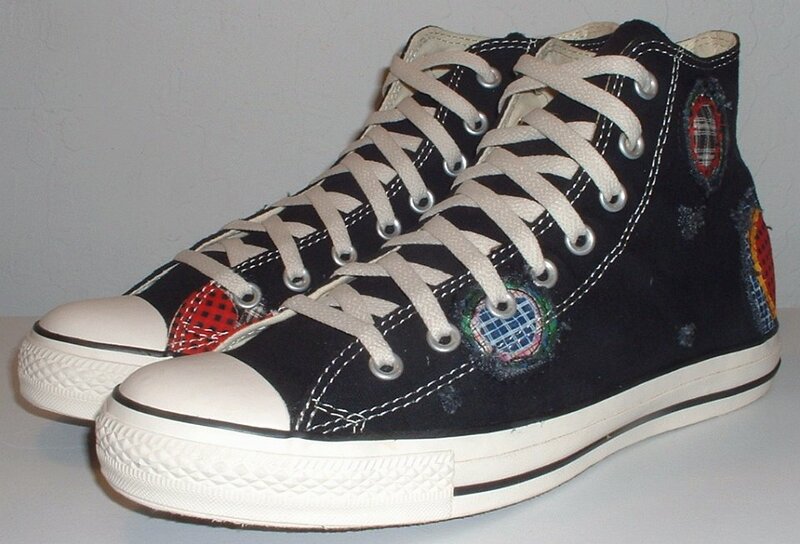 42 Patchwork High Top and Low Cut Chucks Wearing white patches high tops, side and angled front views. 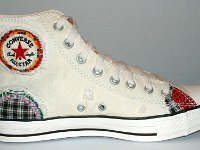 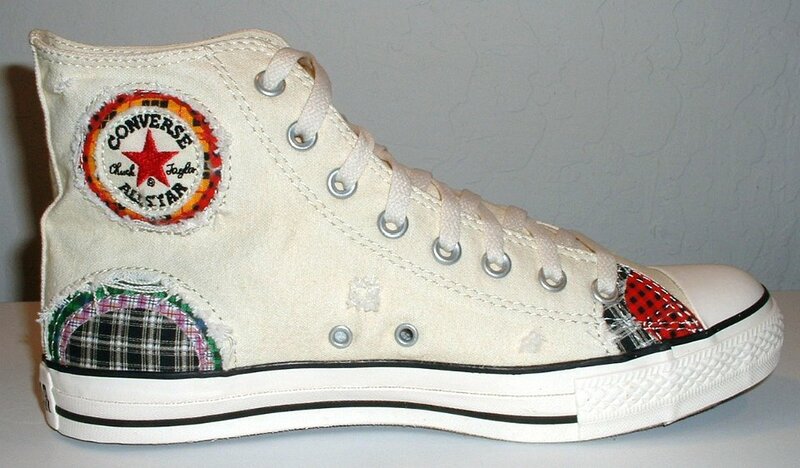 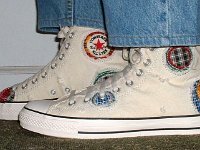 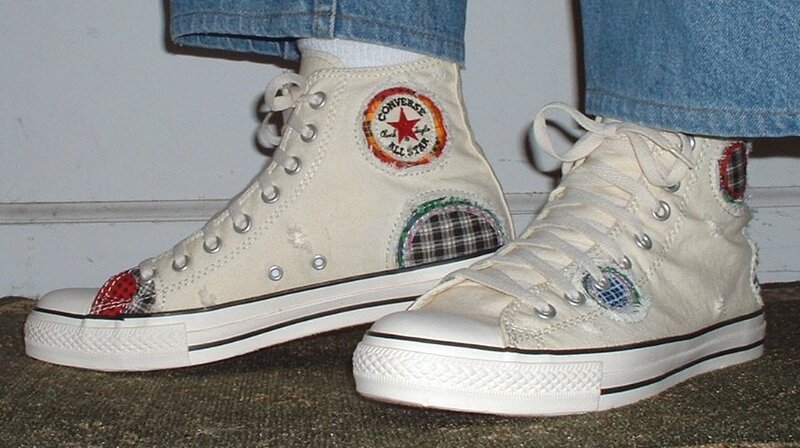 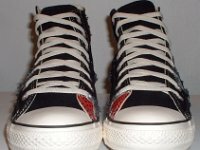 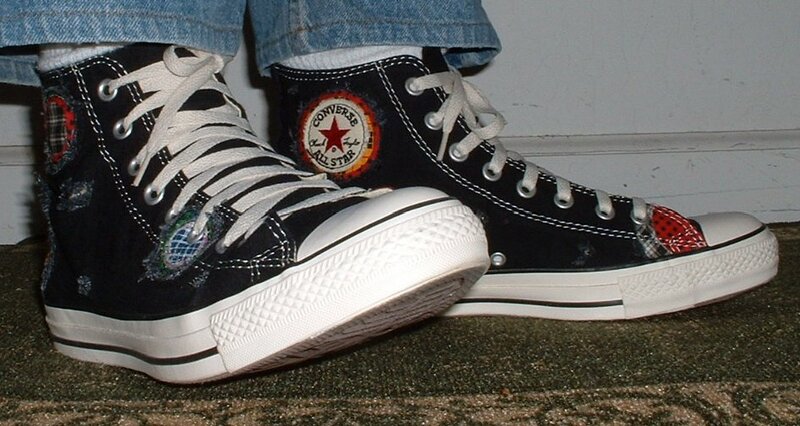 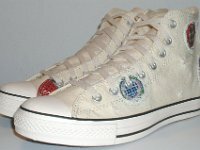 43 Chuck Taylor PatchworkPatchwork High Top and Low Cut Chucks Wearing white patches high tops, side view. 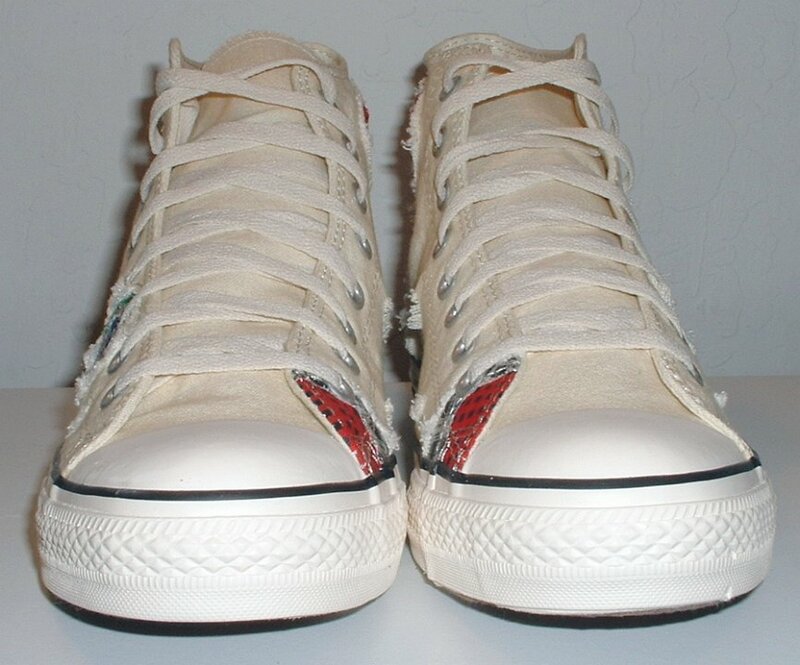 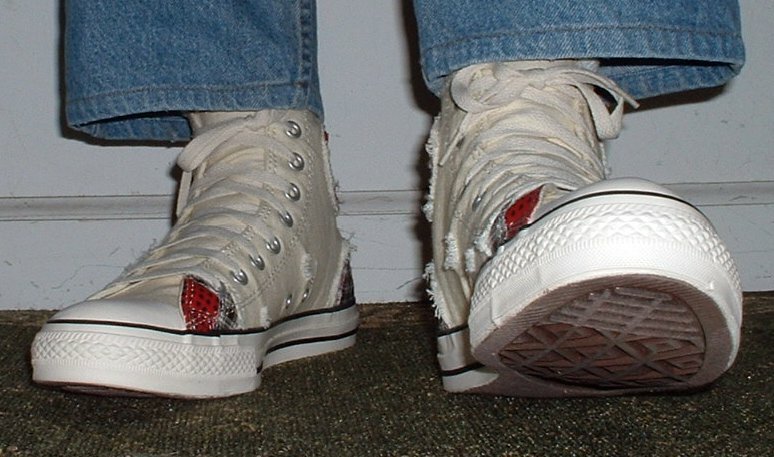 44 Patchwork High Top and Low Cut Chucks Stepping up in white patches high tops, rear view. 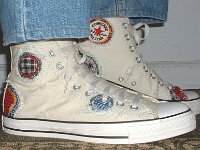 45 Patchwork High Top and Low Cut Chucks Wearing white patches high tops, side view. 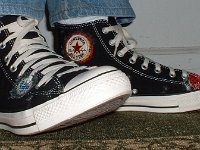 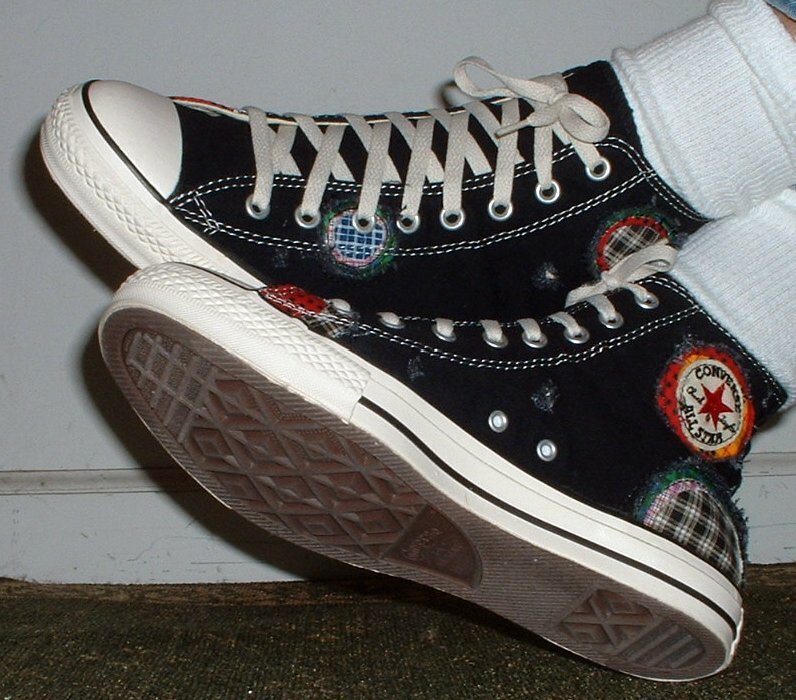 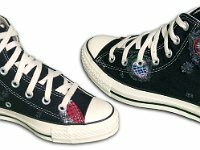 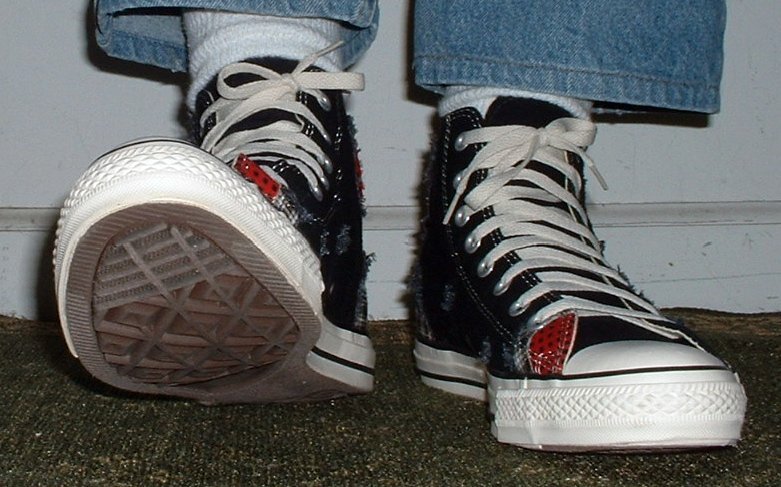 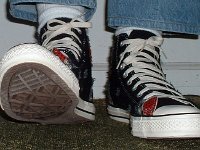 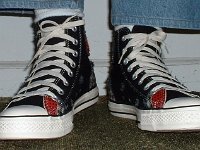 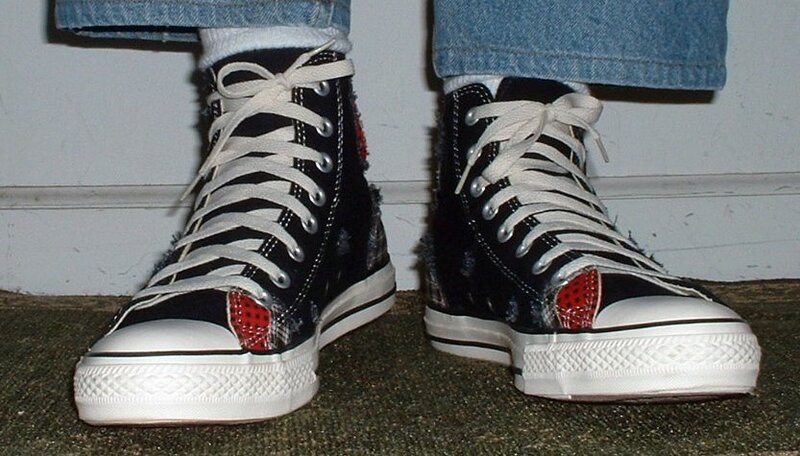 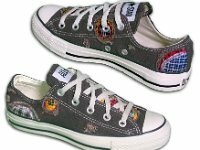 The Chuck Taylor Patchwork series is another "distressed" style line of shoes issue by Converse, first released in 2006 in both high top and low cut models. 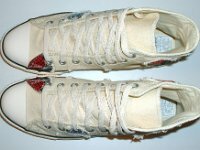 The shoes are made of distressed canvas with holes in the main canvas in several places. 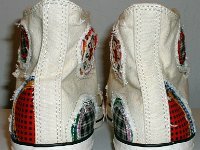 Different colorful patches are sewn in under larger holes in the canvas. 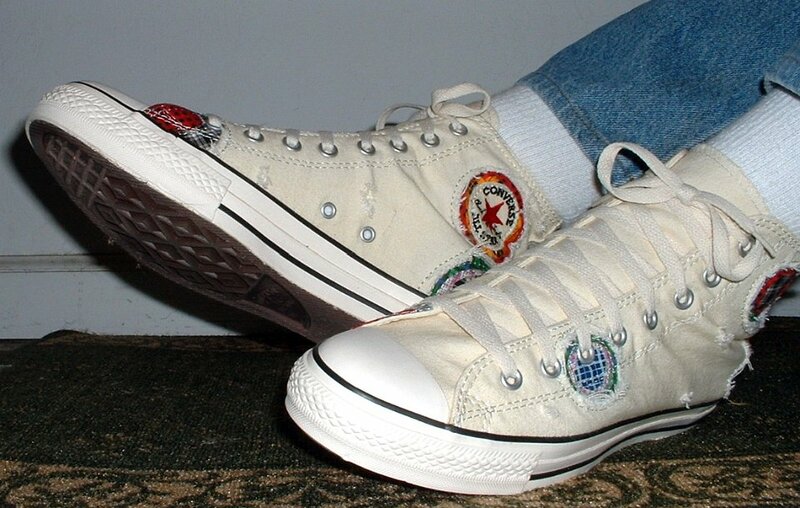 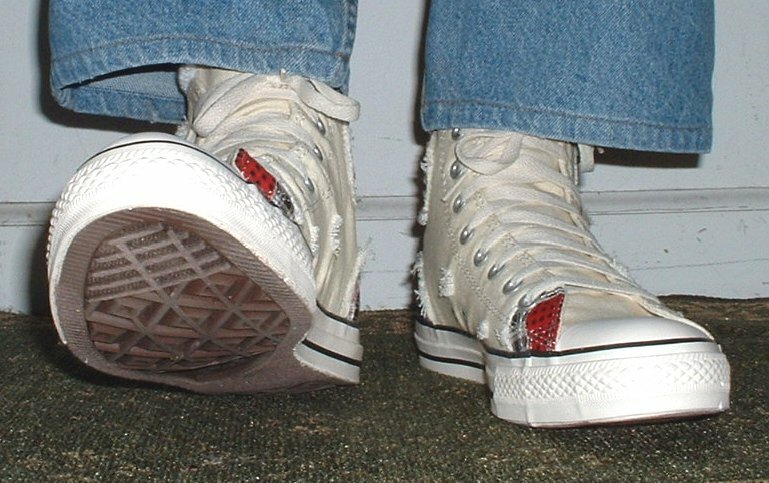 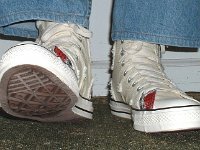 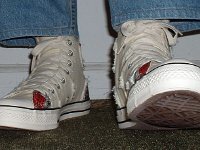 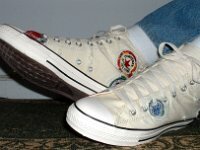 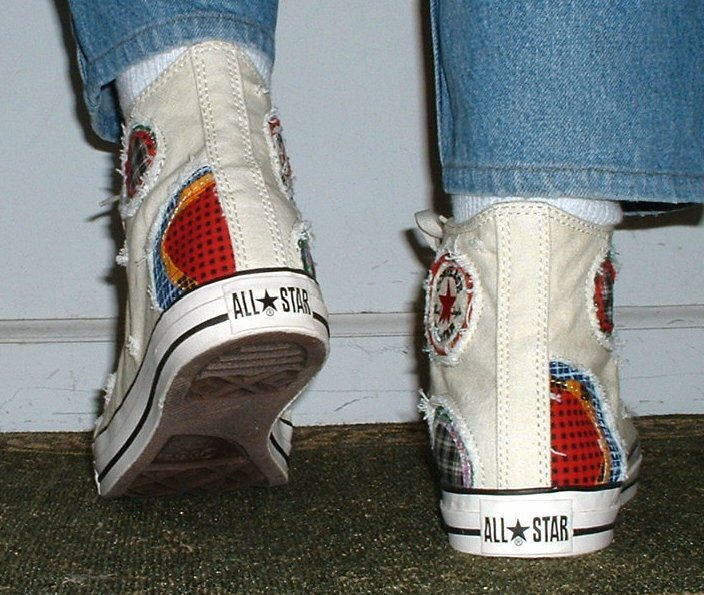 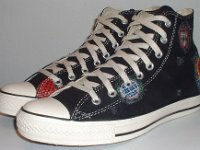 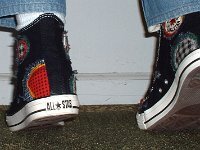 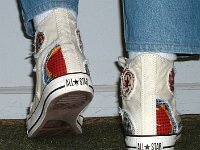 The inside ankle patch is a unique patchwork version of the Chuck Taylor star logo, sewn on a white circle with an orange, red, and black patch underneath. 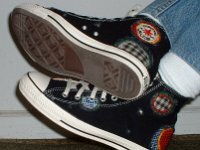 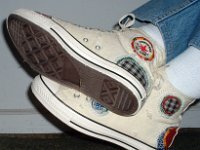 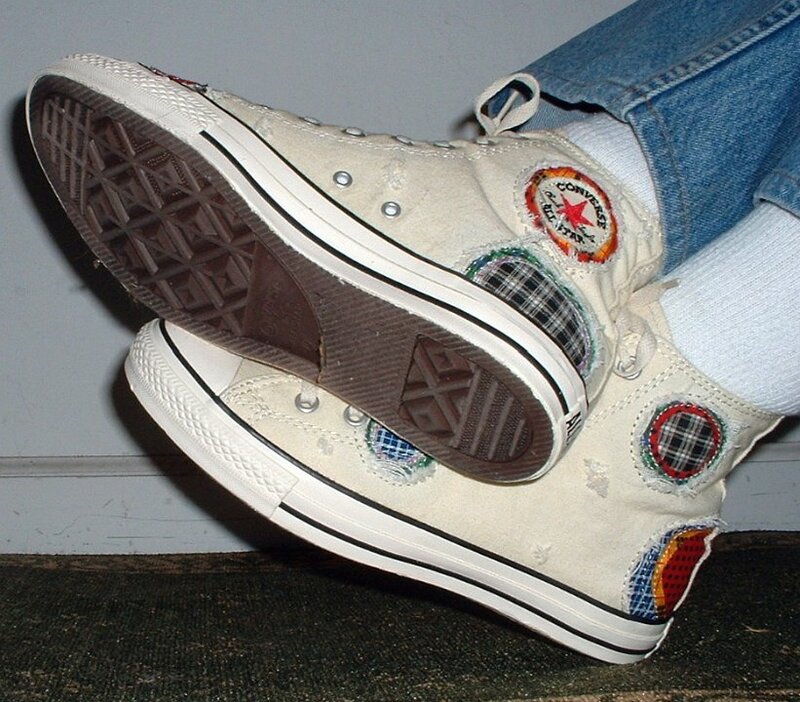 The different patches on the shoes resemble piecework that you might see on quilts or really old jeans, with plaid, striped, and dotted patterns. 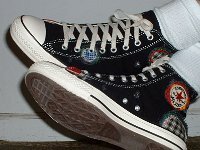 The Patchwork series was seasonal in nature, so only available in 2006 and 2007.